Right off the bat this is a glossy metallic paper complete with the expected pearly sheen and subtle eggshell-like texture that you may be familiar with from the Photo Rag® papers. A recent addition to the FineArt line, this brand new metallic paper shines, no pun intended. Know that you're getting a museum quality paper that's age resistant and is going to last so if this style of finish suits your fancy, feel comfortable knowing that your images (when properly maintained) are going to outlast you. As this is a metallic paper of the glossy variety and after seeing the pearl tone finish of the blank 11x17 sheets, I opted to select a variety of images that I've shot including color and monochrome as well as location portraits, studio lighting, and nature images. Personal preference plays a huge roll in paper selection and presentation and the content of your work plays an integral role in determining which paper you opt to print on. In my previous experience with other metallic papers I've found that an image with more specular highlights tend to pair well and can have an added sense of depth from the metallic finish. The texture of the Photo Rag® paper is a beautiful one; a soft and subtle texture compared to a more boldly designated textured paper like William Turner or Albrecht Dürer. It's really nice to see that this texture carries through the metallic finish and both looks and feels like the Photo Rag® that I'm familiar with. As for the images, the monochrome photos in particular really feel alive and strike me as a good selection for this paper type. As metallic is non-traditional in the sense that it is less common than matte or glossy papers, I would encourage you to experiment with different content to identify what you feel looks the best with this one. Available in both boxes and rolls in a variety of sizes if you've never though about metallic before, now might be a good time to give it some consideration. If you decide to give this one a try, make sure that you download the correct ICC profiles which you'll find here. If you do print something on this paper I'd love to hear your thoughts. I've attempted to have images that both capture the glossy metallic finish as well as the texture of the paper as the angle and lighting plays a big role for this type of paper. Have you printed on any of Hahnemühle's other papers? How do you feel this new entry stacks up compared with the classics? Great images and keep printing. Sometimes people forget the beauty of printing. You never really get the beauty of printing B&W until you print on those fancy paper like Rag paper or Baryta paper. I agree that this fine art paper is an excellent art paper. I believe that the world needs such an art. Keep typing, please! I want to add that there is research paper writing service https://essaybison.com/pay-research-paper/ which also does great things! The service does things that affect the development of art very much! This is a great service that makes our world a better place, as well as these artistic papers. In order for there to be drawbacks, there must be positives to some other kind of self-printing process? This article is about printing on a specific paper. The article infers clearly what printing process would be used. Your comment isn't about the content of the article but rather upon printing using an inkjet process. The article is about how the paper performs using that process. Not about the strengths or weaknesses of that process to other printing methods. Its intended audience would be towards those interested in using the inkjet printing method on this particular paper. Dye sublimation; the transference of printed images to a synthetic substrate by the application of heat. I've done coffee cups, t-shirts, rocks, coasters using dye sub but that's not printing on paper. The paper would require a poly substrate and heat. 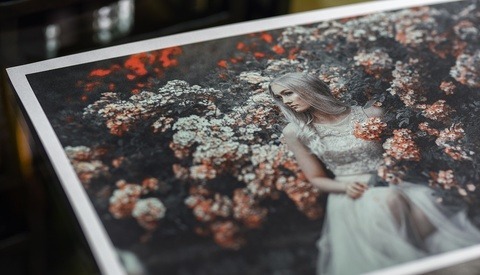 Traditional photo paper: Given over 99.999% of photographs created daily are digital, how do you transfer a digital photograph onto traditional photo paper? Is there a special projector which casts the digital image onto the photo paper? Certainly not a common method. No metamerism? Quoting wiki; "However, the human eye contains only three color receptors (three types of cone cells), which means that all colors are reduced to three sensory quantities, called the tristimulus values. Metamerism occurs because each type of cone responds to the cumulative energy from a broad range of wavelengths, so that different combinations of light across all wavelengths can produce an equivalent receptor response and the same tristimulus values or color sensation. In color science, the set of sensory spectral sensitivity curves is numerically represented by color matching functions." Given metamerism occurs due to human eye biology, its difficult to understand where dye sublimation would present any different influences except in the degree to which colors may be infused into the substrate. To suggest dye sublimation won't present sensory spectral sensitivity in the human eye or has numeric representation is puzzling. 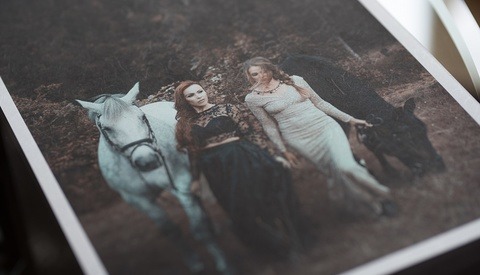 The content of the article was specifically about inkjet printing onto Hahnemühle's Fine Art paper. Nothing comparative about different printing methods. Evan, thanks for the article. I plan on getting some to play with! Does this look right (the "PR Metallic" part?)? you may contact our tech support travis@hahnemuhleusa.com for any assistance. Thanks for the comment Peter, definitely defer to Hahnemühle's tech support as they would be able to troubleshoot for you much better than I can. Hope that you get it all squared and like the paper!